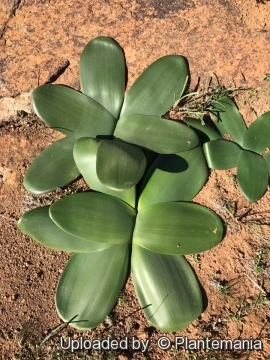 Habitat: Widespread through the arid succulent Karoo, mainly in winter rain fall regions on open flats, coastal sand, gently hill slopes, rocky outcrops, loam, granite and clayey or gravelly soils. Like many of the plants in this area, it is finely tuned to survive the Karoo's challenging climate. Temperatures are high all the year. Ecology: Brunsvigia bosmaniae produces a spectacular floral display during autumn when little else is flowering in the veld. Heavy rains in March–April trigger the great pink balloons of the Brunsvigia bosmaniae, explode into flower along with the occasional starry bursts of Crossyne flava. The scented flowers are regularly visited at dusk by noctuid and hawk moth. The dry flower heads function well in dispersing the seeds. The light, spherical, fruiting heads break away from the bulb when dry. The kite-like shape of the capsule makes it easy for the heads to roll across the ground in the wind. As the dry flower heads tumble across the ground, the capsules break open and scatter the seeds. Description: Brunsvigia bosmaniae, probably the most well known species in the genus, is a largish winter growing bulbous plant that produces spectacular rounded heads of shell-pink flowers. The large ball heads of flowers carpet fields in south Africa in autumn creating one of the most spectacular of all floral displays in the world. When in flower has a narcissus-like scent. Habit: It is a deciduous and temperate, bulbous perennials plant (or geophyte) 20-40(-50) cm tall. Bulb: Globose up to 20 cm in diameter with an outer tunic that is characteristically brittle and coppery brown. Leaves: 5-6(-8) prostrate, deciduous, in 2 ranks, smooth, broadly tongue-shaped, leathery, dark green often with reddish cartilaginous margins. The foliage is produced after the flowering heads have broken away and leaves lie flat on the ground when mature but are leathery and dry at flowering. Flowers: 20-40 (rarely to70) born on a short stem in a large, rounded head up to 40 (rarely up to 60) cm in diameter. They are very showy, irregularly funnel-shaped, slightly tubular, in shades of pale to bright pink, with characteristic darker keels, with flaring tepals, and deliciously narcissus-scented. Pedicels as long as or much longer than the flowers. Stamens flexed downwards and the outer three stamens are about half as long as the inner three. Blooming season: The flowering period, which last 1-3 weeks, is restricted to late summer and autumn (March–April in habitat). Fruits: 3-winged and heavily ribbed, 30-60 mm long. 6) Du Plessis, N. & Duncan, G. “Bulbous plants of southern Africa.” Tafelberg, Cape Town.1989. 9) Strelitzia 10. National Botanical Institute, Pretoria. 15) M. Charters. "Plant Names A–B". The Eponym Dictionary of Southern African Plants. Cultivation and Propagation: Although usually grown only by specialist bulb-grower it presents no great difficulty in cultivation. The ease of culture make it an invaluable subject for the impassioned bulb-growers. 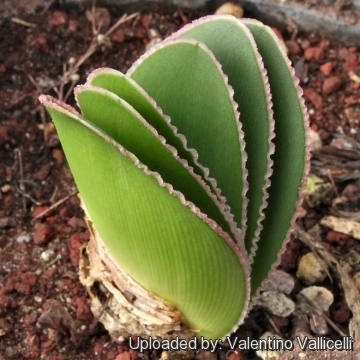 Growing rate: This is a very slow growing species, and bulbs start flowering when at least 10 (or more) years old. Soil: Brunsvigia bosmaniae, like all other brunsvigias and amaryllids, requires very well-drained soils. Out-of-Doors prefers sandy soil, sandy loam soil, or even clay loam soils - provided the drainage is good. In pot it needs an open medium comprising equal parts of well decomposed compost or finely milled bark, and river or silica sand (or pumice). Plant the bulbs with the neck at, or just below soil level and can remain in the same position for many years. 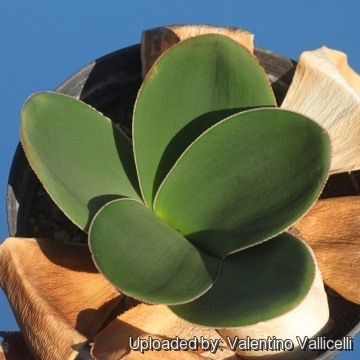 Grows it in pots with a diameter of at least 25 cm. Give it excellent drainage. 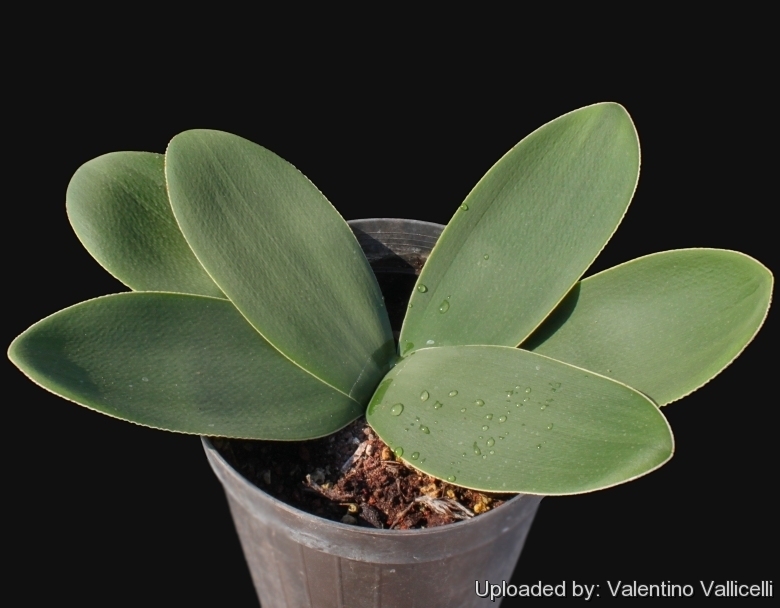 Repotting: In common with other Brunsvigia species, plants will not flower if repeatedly disturbed by replanting. Fertilization: Because bulbs are adapted to poor soil, feeding is not really necessary, but some ash will not do them any harm. On pots fertilize moderately during the growing season with diluted high potassium fertilizer. Exposure: It is most suitably grown in full exposed areas but it will even grow and bloom in semi-shaded. Watering: As it is a deciduous winter-growing plant, it likes moisture from late summer to early spring, and withhold whater from late spring to summer (dormancy period ). Reduce watering in winter to once every two weeks, although they do survive heavy winter rainfall. Hardiness: They are sensitive to frost, but are said to be hardy -10° C (or even less). Garden uses: In warm and temperate climates grow it shady courtyard gardens, in raised beds, shaded rockeries. In countries with cold winter climates, they are best grown in containers in a cool or slightly heated greenhouse. The plants are mostly grown by specialist bulb collectors, usually as container subjects. Traditional uses: The bulbs of the Brunsvigia species in southern Africa have traditionally been used as decoctions to heighten the accuracy of the readings made by local diviners when throwing their dice. Brunsvigia species are rich in alkaloids, particularly brunsvigine or 5,11b-methanomorphanthridine, and may be extremely toxic. Pest and diseases: The bulbs and leaf bases of Brunsvigia are susceptible to attack by mealy bugs, and the leaf margins are chewed by snout beetles and slugs at night. 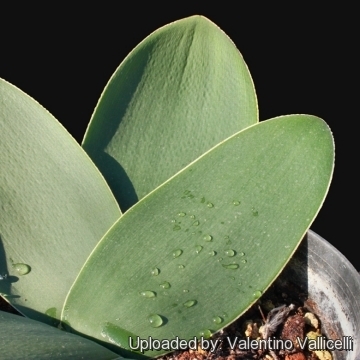 Propagation: From seed. Seeds form readily and should be harvested and sown as soon as they can be easily removed from the capsules. 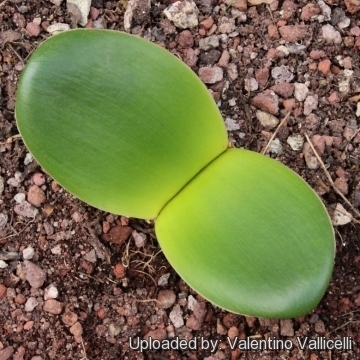 Brunsvigia bosmaniaeseeds germinate without difficulty. As soon as the seeds are ripe and fleshy they can be sown directly into a well drained sandy/loam soil. Seeds may take up to two months before the first leaf appears above ground, and a further 10 to 20 years to flower for the first time. Seeds should be sown 5mm below the soil surface. Do not sow the seeds too deep. If it is the intention to plant these seedlings out into a bag or pot, they can be transplanted in their third year. Once planted in a permanent position do not move them around – they will not flower if they are constantly dug-up and moved from one location to the next. A word of caution - do not plant the young bulbs too deep. Ensure the slender neck of the bulb is just protruding above the soil with the bulb part underground.